You’ve done what you presume is the hardest part in building your site, getting it looking the way you want it, putting everything in place, and launching it. But then you notice it’s just sitting there in a virtual wasteland with nobody seeing it. What use is having an online presence when nobody knows you exist? This is one of the things that takes new website owners by surprise as they figure that stuff just happens by itself once they publish their brand new site. Building the site is the super easy part. But growing the site and getting traffic is where the real work lies. With so many tens of millions of websites out there, how will yours stand out and how will you get people to flock over to see what you have to offer? You need traffic and to get it, you have to figure out how to go about it. In this guide, you’re going to learn about traffic generation and how to optimize your site and use the many different platforms out there to grow your brand and business. You’ll learn about the power of a blog, the on-site technical work to get the search engines to love you, how to utilize the full power of social media including Facebook and Twitter, creating effective marketing campaigns and much more. You’ll also learn how to increase sales and improve your ROI, gain more subscribers, use paid ad campaigns, etc. This is the encyclopedia of traffic generation and it’s totally up to date so you’re getting the latest and greatest stuff. 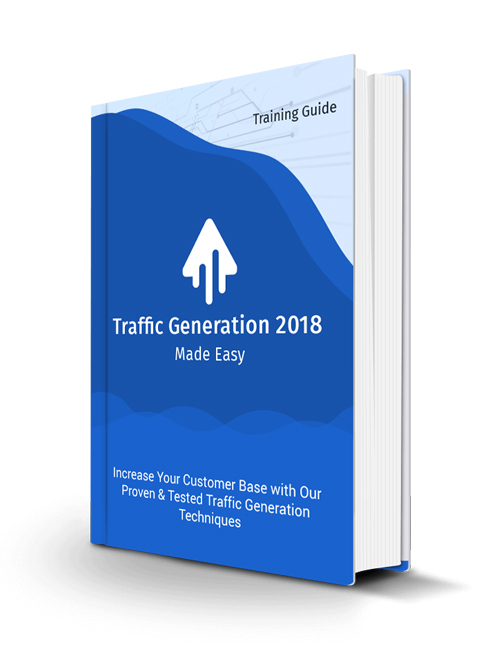 You can go for the Traffic Generation 2018 Made Easy video course if you prefer to skip the reading and learn from videos. If you’re serious about lighting it up with your business, hit the download button now.